Tank Infantry Communication: That’s Right, Tanks, and Infantry radios Did Not Talk to Each Other! M4 tanks, and US Armor in general couldn’t talk to the infantry they were tasked to support. When I first read about the communication problems between tankers, and the ‘doughs’ they were fighting with I was surprised. It’s hard to believe in today’s world; talking to people inside a vehicle right next to you would be a problem, like send a text right bro? Well not back in the forties, they did have two-way radios, but the technology used vacuum tubes, because transistors had not been invented, and they were not very reliable and had a limited number of radio frequencies they could talk on. They also had the problem that tank radios and infantry radios did not share frequencies or even band! This M4 Composite hull supporting the 96th ID on Okinawa has an infantry phone, and there is Dough on it. So Shermans would be sent to support Infantry, usually, a separate tank battalion would send a platoon over to regiment of infantry, often the battalion would be assigned to the same infantry division for a long period of time so they could get used to working with the same people. This helped, but in combat, they still had real communication problems, no matter how long they had worked together in training. This problem didn’t really come to the top until after D-Day when the Sherman was supporting infantry in the bocage country, and close cooperation was needed. A platoon could be broken down further to support smaller units as well, and it wasn’t unheard of for a single tank to support a company, though they really tried to at least keep tanks paired up. Things would normally go well communication wise before the shooting started; at least the tank commander would be riding with his head stuck out; so he could talk to the infantry riding on his tank or walking around it. A savvy infantry officer may be up on the tank talking to the commander. Once the tank started taking enough fire for the crew to close those hatches, everything changed. No amount of yelling or even banging on the tank would get the crews attention. Since the tanks and infantry were not on the same radio nets, if they wanted to get orders to the tank through the radio, they had to radio up to battalion or regiment level, get someone to find the tank battalion commander or someone who could talk to the tank on the radio, and then hope, they could get that actual tank on the net during the firefight. This did not work well. Often it took a man standing in front of the tank and waving his arms to get them to open up, this clearly was not an ideal solution either, and even when the commander did pop his head out, he had a very hard time hearing anything with his helmet on. If the tank unit and infantry units got to train together and had been working together for a long time, this was less of a problem than a tank battalion assigned to a new infantry division with no combat time and little tank/infantry training. This lack of combination became a clear and prominent problem in the bocage fighting in Normandy when infantry wouldn’t be able to warn the tank they were working with of an imminent threat in a timely manner. The infantry would often be forced to fall back from the tanks leaving them alone, and easy targets for enemy infantry close assaults. 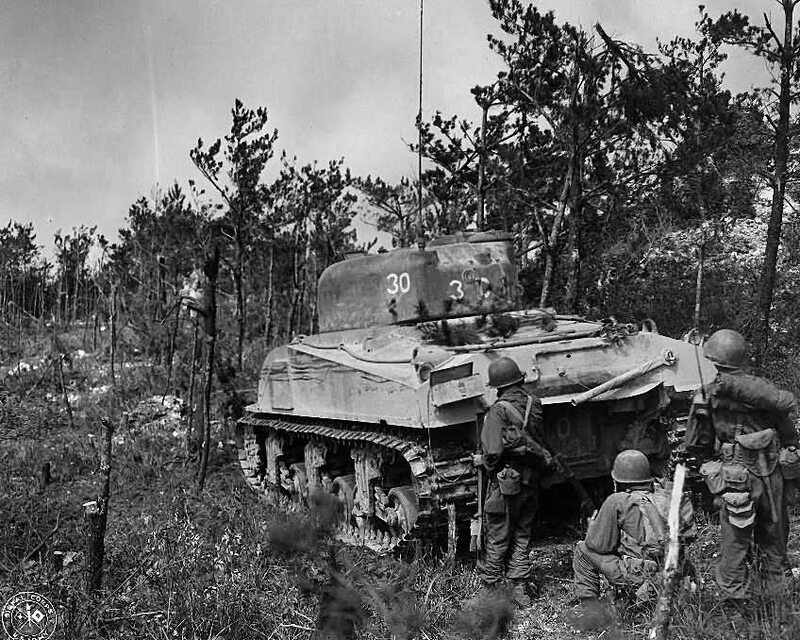 Various solutions were improvised in the field; they tried using the infantry’s handy talky from inside the tank, but the tanks electrical system caused too much interference. They also tried giving company level infantry headquarters spare tank radios, mounted to a backboard, but they were really too heavy to be practical, and not common enough to be all that useful. Some smart tanker figured out if you poked the handy talkie’s antennae out of the hatch, it worked, and that was the best solution for a little while. They also tried rigging up field telephones, with spools on the back of the tanks to let out the phone wire as they advanced, but the wire broke easily and restricted how the tank could move. The best solution was worked out by Operation Cobra, and many tanks went into combat sporting it. 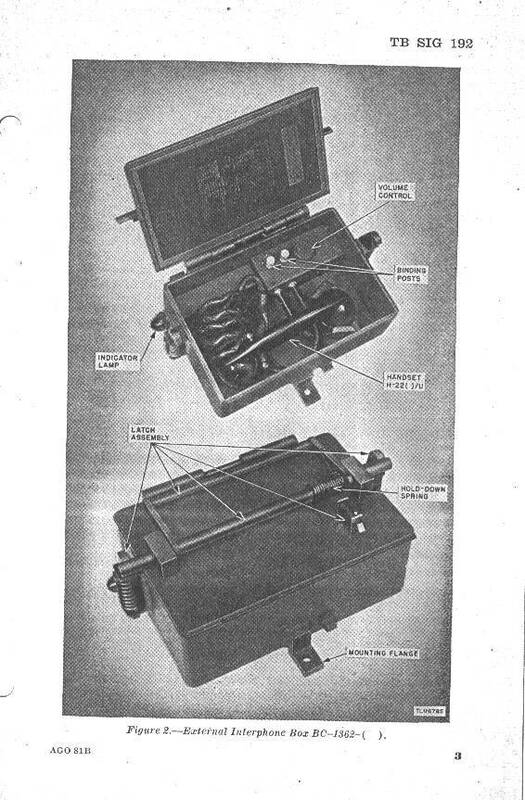 The fix was mounting an EE-8 field telephone in a .30 caliber ammo box on the back of the tank. This phone was wired into the tanks intercom so anyone could walk up and say, “Hey! You blind Sonsobitches!! Shoot the machine gun nest over to the right, that house you’re shooting up is empty, you stupid bastards! !” or something to that effect. This, of course, could get the infantry guy, who wanted to talk to the tank shot, since he had to stand up behind the tank, but they still haven’t come up with something better, and M1A2 Abrams tanks are getting infantry phones installed on them now. The Marines came up with this solution as well, but faster, since they used the M4 for much less time than the Army. They did come up with it around the same time as well, in July of 44. They found it essential for working in close with the fellow marines. The Japanese at this point was using man-powered shaped charges on a pole, or magnetic mines, and the tanks really depended on the infantry around them to be their eyes. Marine tanks operated buttoned up once the shooting started, without the phone, they were much less effective. Here’s a link to a little Army video on the subject of the tank, infantry team. Now that I think of it, it IS kind of interesting that the US were the only ones who ever came up wit this. This must have been a problem for the other armies as well. Although the M1 tank is not designed to carry riders easily, provisions exist for the Abrams to transport troops in tank desant with the turret stabilization device switched off. A battle equipped infantry squad may ride on the rear of the tank, behind the turret. The soldiers can use ropes and equipment straps to provide handholds and snap links to secure themselves. If and when enemy contact is made, the tank conceals itself allowing the infantry to dismount. Let me share our family story, corroborated by surviving members of the 743d Tank Battalion who were serving with the 30th I.D. Weeks after the D-Day landings, due to high infantry losses based in part because of a lack of useful communication coordination between tankers and those on the ground fighting, the commanding officer, Col. Duncan 743d Tank Battalion ordered one of his officers, Captain Edward D. Miller (my father-in-law), who was the S-3 and a former signal solider, to come up with a solution damned quick for the infantry who’d been unable to communicate effectively with tanks and direct their fire. He worked on a solution overnight and came up with that concept of using an EE-8 field telephone in a .30 caliber ammo box on the back of their M4s. The Battalion S-2, Captain Robert Speers, was dispatched to 30th I.D. with the proposed plan. When Captain Speer reported back to the 743d’s HQ, he was all smiles, telling Capt. Miller that they loved the plan, sent it forward to V Corps, and that resources were being pulled together to get some units made ASAP. Dad never made a big deal out of his contribution, but as a Army Vietnam era Vet myself, I realize this was the sort of field expediency fix to a problem much as the Cullen Hedgerow device had been. I’m just so very proud to have known him. He ended his career in 1965 as a full Colonel, as did his long-time friend, Colonel Speers, who I got to meet a few times, as well. Dad passed in 2014, a week after the 60th anniversary of D-Day. Thanks for sharing, it’s really amazing they got that far into the war, in Europe and the Pacific, before solving the problem. The tank/infantry phone remained a feature of all future US tanks as well, until the M1, and the current M1A2 tanks have them again, because it’s a very useful idea. Thanks again for sharing your family story! It’s one of thousands of testaments to the resourcefulness of the American GI, even hampered by a lack of effective communication they still brought the Axis forces to their knees. Notice that the German tanks didn’t have infantry phones either. Or walkie talkies, etc. Just saying, it wasn’t like the Germans had an edge there or something. The Radio Set AN/VRC-3 consists of an 18-tube, low power, battery-operated radio receiver and transmitter and accessories. It is designed for frequency-modulated (f-m), two-way communication over short distances. Primarily intended for installation in light and medium tanks to provide communication between tanks and supporting infantry, this set may be used as a walkie-talkie when removed from the tank and carried by hand. The complete radio set weighs about 34 pounds in portable use. The main component of Radio Set AN/VRC-3 is Radio Receiver and Transmitter BC-1000-A. This was an obvious choice as it is the very same man pack radio that was currently being used by the infantry. 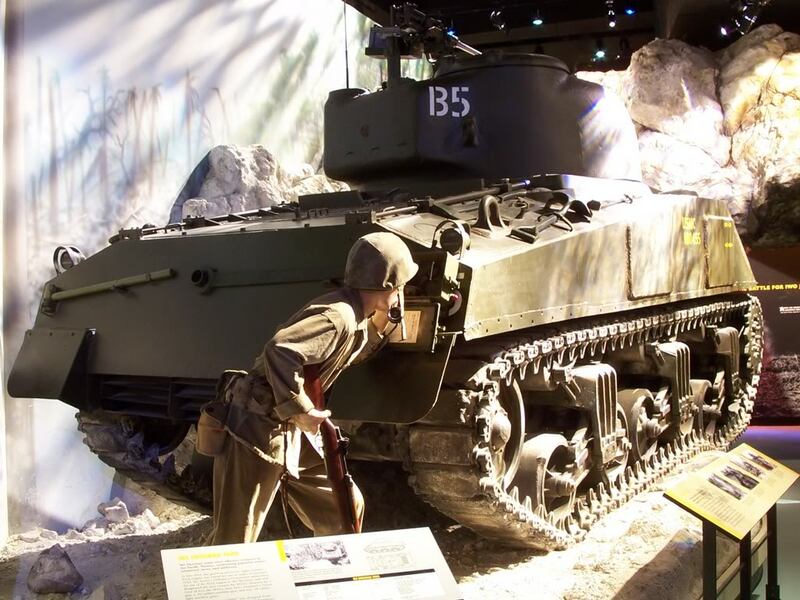 The AN/VRC-3 was installed in the M5 Stewart light tank and the M4 Sherman medium tank, wired into the existing intercom systems and used in conjunction with the existing standard tank radio. The tank commander could switch between operation of either the SCR-508, which was used to communicate with HQ, or the AN/VRC-3 to communicate with infantry troops. I think I’ve seen pictures of a poor Dough carrying one of these radios! I have a fully working BC-1000. I carry it at re-enactments, parades and veterans events. It weighs 35 lbs but has a nice harness and it’s not so bad. That’s really cool. I’d love to have working WWII radios, but the wife already things the books take up to much space! Hey, this website was MY Idea! Besides you have all kinds of books you never read that have nothing to do with Sherman tanks. Tom Clancy novels maybe? BTW, I am looking for one of these rear mounted telephones if anyone has one for sale. What are you going to put it on? A Sherman. Not mine, HA, I wish. There’s a guy I know here that is restoring a Sherman. I’m providing the radio and would like to have the phone to go with it. If you don’t want to say, that’s cool, but can you tell me more about the Sherman resto and where it’s taking place? I know of one in Europe, and one in Vegas. I would say, but it’s not my place to do so. No problem Mike! I totally understand! I hope the gentlemen knows about the page! I just might have one in great original condition. There were a couple other alternatives. Namely the SCR-510 (BC-620) which operates at 20.0 – 27.9 kc, exactly the same frequencies as the SCR-508 tank radio. Also the BC-659 which operated at 27.0 – 38.9 kc. That crossed over the SCR-508 at 27.0 – 27.9 kc. Both of these radios were commonly mounted in jeeps, command cars and scout cars. If an infantry unit was lucky enough to have one of these radios available and were able to co-ordinate with the tank on their freqs ahead of time they could communicate. Yes, the SCR-508 could communicate on only 10 preset channels at a time BUT with the second receiver could listen to all 80 channels as the receiver was MO tuned. This was the reason for having the second receiver. One was set to which ever channel the transmitter was on and the other was set to monitor any other of the 80 channels that may have been in use at the time. Thanks for the information in your comment. I had a bit of trouble with the radio section, the old radio manuals are a tad bit to follow and all the videos I watched seemed to be in another language. It is a really fascinating subject, and I think it’s really interesting how much mechanical noise the old radios made! I love the subject. I am a WW2 radio NUT! They are indeed. I recently discovered a technical manual I have had for some time. To my surprise it was directly applicable to this subject. I hope the information I added is a benefit to your article. Mike, it really is, and I love any feedback, in particular corrections for my mistakes! It’s hard to believe they couldn’t talk, but I suppose it’s true, Radio’s are a mystery to me.